Home / Case Results / New York Trip and Fall Lawyer Review: Tiffany L.
New York Trip and Fall Lawyer Review: Tiffany L.
These injuries made it difficult for Tiffany to function normally, and she was unable to work for some time. Tiffany worried for her increasing medical bills and knew she needed legal help. Luckily, her brother suggested that she contact Adam Handler’s law office at Pollack, Pollack, Isaac & DeCicco, LLP. 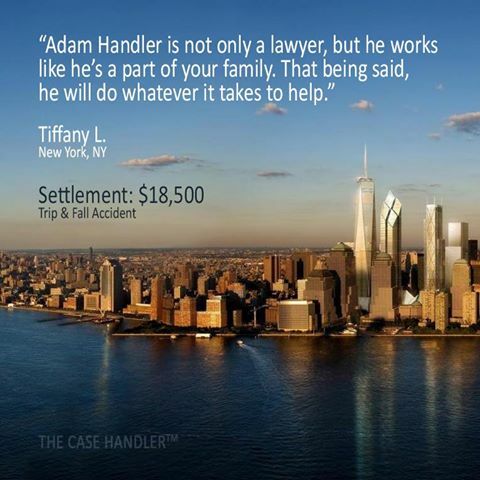 Adam successfully ‘handled’ her case and helped Tiffany win $18,500. “It’s a great relief and I was not so stressed about paying my medical bills out of pocket.” -Tiffany L.
Congratulations Tiffany! We are here for you if you ever need legal guidance in the future.